The rival of Greenpoint for most sought-after Brooklyn neighborhood has to be Williamsburg. With a trajectory of popularity, gentrification, and rising rent prices like no other neighborhood in Brooklyn, Williamsburg is a giant of industry compared to what it used to be. Williamsburg has become a mecca for the too-freaking-cool, I-knew-about-that-first brooding hipster (with even tinier beanies!). And do you know what they love more than normcore Sketchers, bars alight with only lightbulbs hung with wire, and a sale at Rough Trade? Brunch. But before we steer you away completely, which is not what we are meaning to do, (we just love making fun of Williamsburg) let’s talk about how good these brunches actually are. Brunch in Williamsburg is like walking onto the set of Girls, only to realize these are actual human beings who have a way more carefully curated Instagram page than you, and wouldn’t dare leave a thumb in the vicinity of a frame. Ok, we’ll stop now. Brunch in Williamsburg if you want something to brag about. Egg is actually a brunch sent from socially conscious heaven. Their Brooklyn location is the original one, but there is now an Egg operating in Tokyo as well. Besides the beautiful brunch they serve, Egg also runs their own farm, employs a diverse kitchen staff, and has established a program that emphasizes the importance of literature in the community. We’re already sold based on the aforementioned, but we need to talk about the food, too. Egg makes what you’d expect from the name, but they do it simply and they do it well. With a menu that changes with the season, you’ll probably always be surprised by the different dishes you can try at Egg throughout the year. And before you absolutely run out the door to get to this place, put your shoes on, because breakfast is served all day. The menu includes favorites like grits and eggs, biscuits and gravy, homemade granola, and eggs Rothko. The prices are also extremely good for such well-prepared and thought out food. The New York Times even gave it a glowing review. If you can make the Times happy, we think you’ve made it. Special mentions from the menu include candied bacon, the fried oyster sandwich, hot ham, and pimento cheese, and caramelized grapefruit with mint. Now that your shoes are on, you should go now. Roberta’s is another Williamsburg icon, with many people coming for the pizza, not knowing that they serve brunch as well. 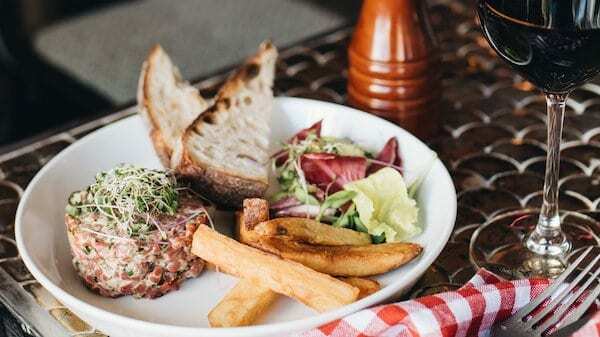 The menu is ever-changing so that the kitchen can experiment with the brunch, but also so the patrons can keep coming back and trying new things. However, the brunch menu does stay a bit limited. In terms of sweets, Roberta’s offers sticky buns and croissants. 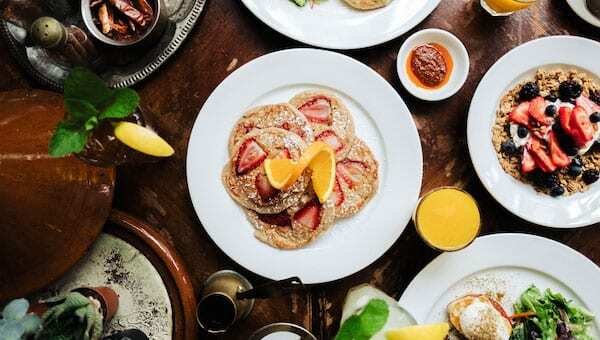 For traditional breakfast dishes, the restaurant serves a twist on the bodega bacon, egg, and cheese (on a croissant with fingerling potatoes), buttermilk pancakes, and scrambled eggs served with broccolini and pecorino. If you’re feeling extra hungry, there’s also the double cheeseburger. Aside from breakfast and sandwiches, Roberta’s still serves a selection of pizzas for brunch, which sound just about right with an egg. There’s also a tiki bar included at the restaurant, so wait times can be a lot less boring, and a little more fun. But there are communal tables, so put your most polite hat on for this one. Chicken & waffles is the most popular dish at this hip restaurant. However, don’t sleep on the ricotta pancakes. The pancakes are some of the best in the city! When you think of brunch, you probably don’t think of Moroccan. But you will after eating here. Delicious, fresh ingredients are the key here. The food also feels a bit lighter and healthier on your stomach than other brunches. Cafe Mogador’s Moroccan food is affordable and delicious with good service. Brunch Brunch is available every day at this casual American eatery with a rustic wood-&-brick look. Brunch Locally sourced Southern breakfasts & lunches draw crowds to this rustic-industrial hangout. Brunch American pub with a daily changing menu served in an old-time setting with a communal table. Brunch French bistro fare served in a Williamsburg space with an indoor “garden” room & a roof deck. 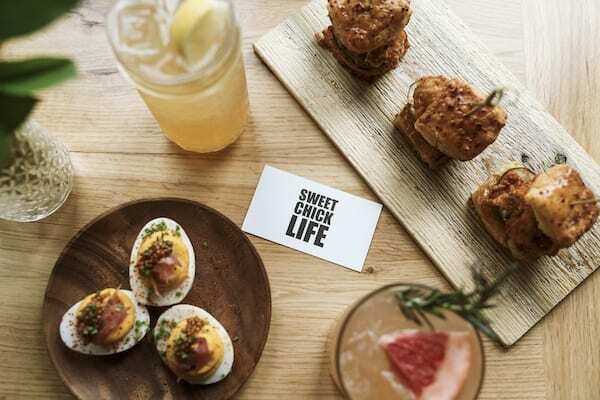 Brunch Fried chicken headlines a menu of Southern specialties, including signature pies for dessert. Brunch Set in the Wythe Hotel, this upscale New American eatery offers seasonal eats in an airy room. Brunch Mediterranean-influenced New American dishes & craft cocktails in casually hip digs with a bar. Brunch Atera alum’s American restaurant with a marketplace, barroom & upstairs dining room & garden. Brunch Light-filled cafe with reclaimed accents & global-accented comfort food morning-early evening. Brunch Retro railcar environs & seasonal New American eats draw cool sorts to this funky spin on the diner. Brunch Gourmet chicken & waffles star at this hip, down-home Southern comfort-food resource with cocktails. Brunch American eatery popular for brunch, with tin ceiling & zinc bar adding a vintage vibe. French Hip, laid-back French bistro in East Williamsburg that’s popular for weekend brunch. Brunch Mellow saloon with a backyard patio, popular brunch, microbrews & a lodgelike vibe. Traditional American Williamsburg neighborhood eatery with a comfort-food American menu & outdoor seating. American Southern-style diner food like fried chicken & breakfast bowls is served in a laid-back setting. Caribbean Colorful, island-inspired spot offering Caribbean fare & cocktails, plus a patio with picnic tables.